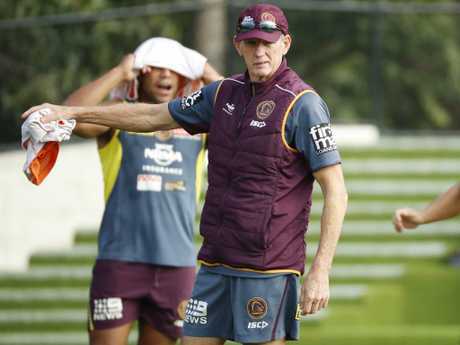 WAYNE Bennett can confidently call the city of Brisbane home after spending the bulk of his painted coaching career at Red Hill, but a surprising move from the Broncos may see the 68-year-old strongarmed out of the club sooner than expected. 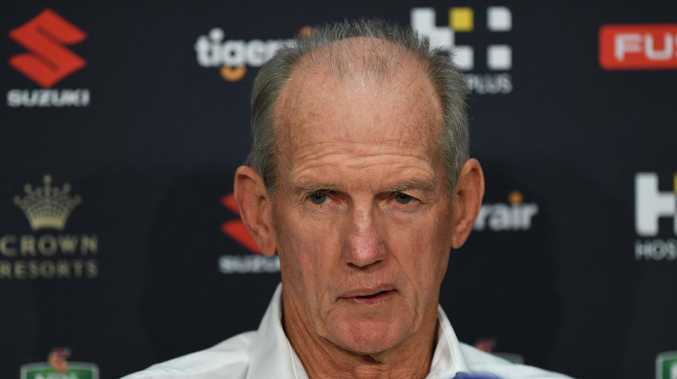 A report from rugby league journalist Ben Dobbin revealed the Broncos turned down a request from the renowned super coach to stay at the club until the end of 2020. "I spoke to Wayne Bennett today," Dobbin told The Footy Show. "He's contracted there until the end of 2019 but what he did do (on Thursday) is go to the board and asked for a year extension until 2020." The Broncos were outed in a giant scheme earlier in the season to snag premiership-winning Storm coach and former Bennett protege Craig Bellamy from Melbourne. "They didn't get their man with Bellamy … there was no success in trying to recruit him and they haven't given Wayne Bennett the year he wanted. 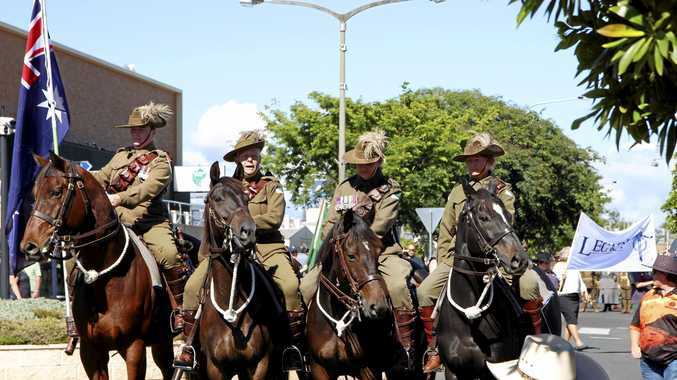 Watch this space," Dobbin continued. The Channel 9 commentator said Bennett "didn't believe" he'd be Brisbane's head coach in 2020. "It's unbelievable considering the success he's had over his time there," he said. It comes as Bennett began making serious moves for the club's future as their 2018 season sees them scraping to stay in the top eight for finals. A record $3.4 million to secure young prop Payne Haas for the next six years - the richest deal put on the table for a teenager in NRL history - made headlines on Wednesday. The deal saw Bennett backflip on an old claim against paying forwards more than $300,000 a year. Bennett admitted his views had changed after signing Haas for over $500,000 a season. "That was a long time ago, that was before the salary cap changed," he told AAP. "But it's all relevant to your ability. The more ability you have got the more relevant it is and I think the really good ones have always got it. "Karmichael Hunt came out here at 18 and was outstanding, Darren Lockyer was 18 here when he played and was outstanding." Bennett revealed Haas signed the groundbreaking contract despite bigger offers put on the table from rival clubs. I don't think anyone realises our offer was small compared to other clubs," he said. He is a player in great demand. We see a long-term future for him here." Jamayne Isaako, who signed with Brisbane on a four-year contract, will wear the No. 1 jersey after turning down strong interest from the Sydney Roosters as Boyd's ultimate retirement from footy draws closer. Bennett said Isaako's move to fullback, which sees veteran Boyd placed in the centres, was "fast tracked" but not necessarily permanent. "We will just see how it works for us," he told AAP reporters. "But I needed to do something at the back there. I just thought we could tighten up our (defensive) positioning in the centres a little bit." Bennett insisted Boyd was fine with his move back to the centres for the crucial clash against the rampaging Panthers. "He was happy as. That was his original position. That is where he played all his football growing up," he said.